Contact us today for great lease and purchase options on new and used equipment. The Raven Hawkeye application system is available as a factory-installed option on all Apache models. Hawkeye takes precision to the next level, allowing operators to determine application rates down to individual spray nozzles. It allows you to vary spray pressure independent of speed and rate. Hawkeye is built on the ISOBUS communication platform. Raven SmarTrax™ AutoSteer Auto-steering helps increase productivity by decreasing operator fatigue. 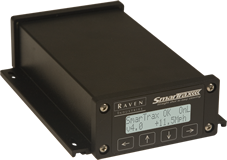 The SmarTrax system runs at operating speeds of up to 27 mph. We also offer Raven’s Cruizer. It is a simple guidance system designed to increase efficiency with applications ranging from tillage to harvest. Cruizer can be joined with SmarTrax, SmartSteer, SmartBoom, and SmartRow.” Cruizer is easily transportable from machine to machine, and allows operators easy viewing of saved and exported maps. SCS 5000TM The SCS console is essential to monitoring efficiency, accuracy and ultimately profitability. Getting every drop of your chemicals has never been a higher priority for applicators. 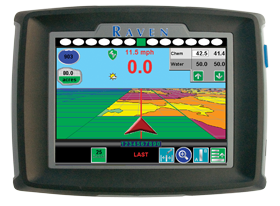 Integrating boom control, auto-steering and variable rate application, a field computer combines all things precision spraying into a user-friendly interface. field maps as you spray. Viper Pro™ With its 10.4” LCD touch-screen, the Viper Pro takes the field computer to the next level . It features graphically enhanced field views and field maps with a back end powered by the Windows XP operating system. It also features “field-to-market” wireless internet. AutoBoom™ The easy-to-operate AutoBoom system helps keep the booms level and out of the dirt as you drive over changing terrain. Functioning at speeds up to 20 mph, it increases the accuracy of rate control and lowers wear and tear on your booms. AutoBoom works seamlessly with the Envizio Pro and Viper Pro rate controllers. AccuBoom™ AccuBoom reduces operator stress by automatically turning booms on and off. It reduces waste and simplifies application from point row to point row. Hilly terrain and contours no longer mean wasted chemicals. AccuBoom works on units with up to ten section booms (seven section for parallel).